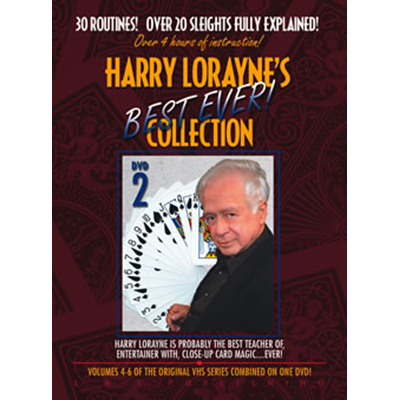 "Harry Lorayne is on the list of the 100 most influential magicians of the century. His videos are a delight...a significant contribution to the literature of close-up magic." It was a particular pleasure to watch Harry Lorayne work in front of, and handle, an audience. It's true: When Harry Lorayne teaches on camera, it's almost as if he's sitting with you in your own living room, helping you, guiding you. It will be hard for you to decide which you enjoy more-the performances or his explanations. As he teaches a particular routine, he also teaches each sleight, each move, the psychology, the attitude. Watching Harry Lorayne is watching impromptu close-up magic at its best. Each and every effect, idea, routine in this entire series can be done with a borrowed deck of cards. You'll be thrilled by Harry Lorayne's performing/teaching ability, by his judgment, selectivity, attention to detail. He never abandons you; whatever he teaches, he teaches thoroughly. He walks you through it hand in hand. Be prepared to sit, watch, enjoy-and learn! 30 ROUTINES! OVER 20 SLEIGHTS FULLY EXPLAINED! Over 4 Hours of instruction!